You can’t walk down the aisle of your local grill shop without seeing the word “Infrared” plastered all over the place. But choosing the right infrared grill is no easy task. That’s due to the many different grill configurations and types of infrared technology available. In this guide you’ll find the best infrared grill at a range of price points as well as lots more information to help decide if you need infrared on your grill. Should You Buy an Infrared Grill? Saber have developed their very own patented cooking system which uses infrared heat. All the burners on the grill use this technology, and unlike most infrared grills which only have one temperature (blazing hot), Sabers patented technology allows for great temperature control. Saber grills also offer fuel efficiency, the capacity for incredibly high temperatures, flare up reduction and the resilience and durability of stainless steel construction. When it comes to durability, all burners, IR emitters and cooking grates are made of 304 stainless steel. This particular model also includes an 18,000 BTU side burner. The burner is dual control and offers you that extra spot on the grill for boiling, wok cooking or keeping food warm. The Saber is very efficient, with the manufacturer claiming it will use up to 30% less propane than other propane grills.This unit can also easily be converted to natural gas, there is a conversion kit available. The unit also comes with two halogen lights positioned inside the grill. This is ideal if you place your grill outside in an area with low lighting – you can still cook at night without needing to rig up an elaborate lighting system. The grill works fast and provides consistent results, cooking the meat evenly. Just because the unit is quality, it does not mean it is complicated. Most people will find it quick and easy to assemble. Cleaning is not too much or an arduous task with these grills. They will clean up well with a grill brush or similar. The thermometer isn’t great, but that is standard on just about any grill, no matter how much you spend. In the case of the Saber, they are inaccurate, small and positioned in a spot that makes them hard to read. The grill can get smoky, but this is the case with most infrared grills. This is the trade-off for the lack of flare-ups, however. As regards to customer service, we hear mixed reports about Saber. Some have had no problems at all when parts have arrived damaged, or have worn out over time. Others report the company is hard to deal with. Thankfully, this is a quality product and you shouldn’t need be calling up for help too often. Because IR grilling is a little different to normal convection cooking, there might be a slight learning curve the first couple of times you use this grill. However, the ease and speed at which you can cook with one of these units is well worth the adjustment. If you are on a tighter budget you will be happy to hear that infrared technology is not limited to expensive grills. The Performance TRU offers 450 square inches of primary cooking space, with a 10000 BTU side burner to boot. For warming, there is also a 150 square inch rack which is porcelain coated, and swings away when not in use. The grill itself performs well, reaching high temperatures with ease. Searing is a pleasure, as the heat is distributed evenly across the cooking plate. 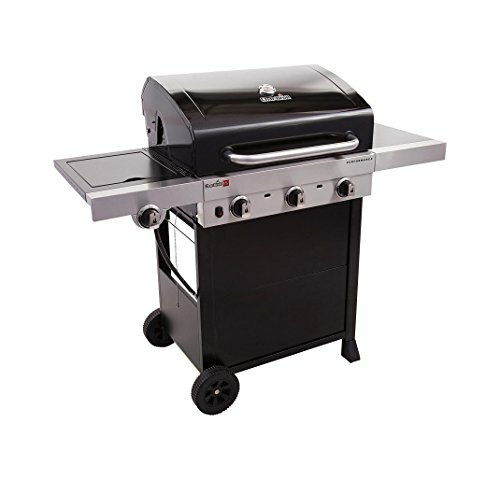 The consistently good results you can achieve on this grill really do rival some of the more expensive competitors. The lid and firebox stand are also porcelain coated for increased durability. Offers a lot of cooking space at an affordable price point. Assembly is straightforward for the most part. Assembling the side burner may prove tricky as the instructions appear a little unclear, but it is not impossible. Ignition is a breeze thanks to the electronic ignition system which syncs all the burners to ensure they all light up at once. This unit has a couple of large wheels, so you can move it around your patio with ease. The side burner has a fold down lid so that it can also be used as an additional space for food prep. The infrared plates on this unit are notoriously difficult to clean. There are small holes in the infrared plates which can get bits of food stuck in them. Not only does this contribute to the difficulty in cleaning the grates but may lead to the odd flare up as these bits of food catch alight. The gas bottle is stored under the unit where other manufacturers may take advantage of the space for shelves. This really is a matter of preference and placing the gas bottle here makes the unit compact and easy to move around, however you might prefer some shelves under the grill to store bottles and utensils. Overall, this is a great infrared grill, at an affordable price point. Aside from the difficult to clean infrared grates, this grill is well worth some consideration. This is the perfect size grill for a motorhome, a boat, or your next camping trip. 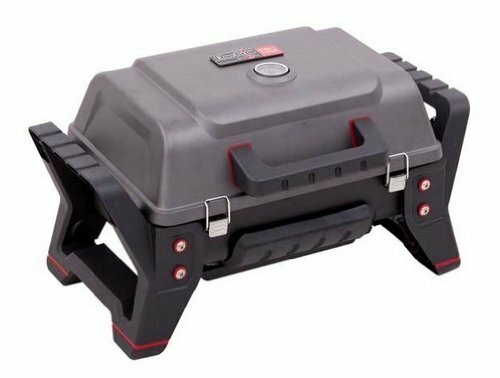 The firebox is cast aluminum and can be latched shut for travel. Just because this unit is small and only weighs 20 pounds, do not think it is flimsy. It is built for life on the road and all the bumps and bruises that go along with it. Similarly, it’s small size does not mean it cannot pack a punch temperature wise. It will get just as hot as the big boys, in fact, the intense heat produced by this little unit needs some reigning in – but we have addressed this issue further down in this section. Perfect size for those who want to take their grill on the road. Heats up super-fast, and can sear like a full size grill. Without a regulator, keeping the temperature down when cooking pork or chicken is near impossible. With the addition of a valve such as the ‘Bayou classic Control”, you should be able to stay at temps around the 300-400°F mark and cook chicken with no problems. You do need to clean and season these cooking plates thoroughly, as they can develop surface rust quickly if food residue is left on them. The 200 square inch cooking grate is enough to cook for two at the very least. We have heard some say they can cook for six on this little grill – in the end it comes down to what you are cooking and how hungry you are. This grill offers 320 square inches of cooking space, which means around 8 – 10 burgers, yet will fit on a smaller patio with ease. The gas bottle fits neatly under the unit itself which is another plus for those who do not have much room to spare. Due to the unit being a smaller size and infrared, you will also notice that it does not chew up the gas much at all. If you have a convection grill and can’t afford a new infrared unit, you could purchase one of these to sear on the side. Affordable purchase price and lower running costs. This unit is nice and easy when it comes to cleanup. Like most infrared grills, it is simply a matter of closing the lid, turning the temperature up full blast and leaving it for 15 minutes. Food will burn off, and any residue will be nicely charred and easy to scrape off later. This unit is easy to ignite thanks to the electric ignition system. The paint on this unit is not as resilient as it could be. Don’t be surprised if you notice some color changes or bubbling after a few cooks. This grill can be a little complicated to assemble, so make sure you set aside plenty of time just in case you find it baffling. If you are looking at buying one of these second hand, be aware that in 2013 there was a recall related to the ignitor switch. The fault meant that there could be a build-up of gas which, when lit, caused a fireball – clearly problematic. The issue was addressed, and parts sent to affected customers free of charge. Make sure you check the year model of the unit, and confirm that the issue was fixed if it is a 2013 model. These high quality grills aren’t the cheapest option, but there isn’t much they can’t do. If you have a bit of cash to throw at a grill, then these are definitely worth a look. 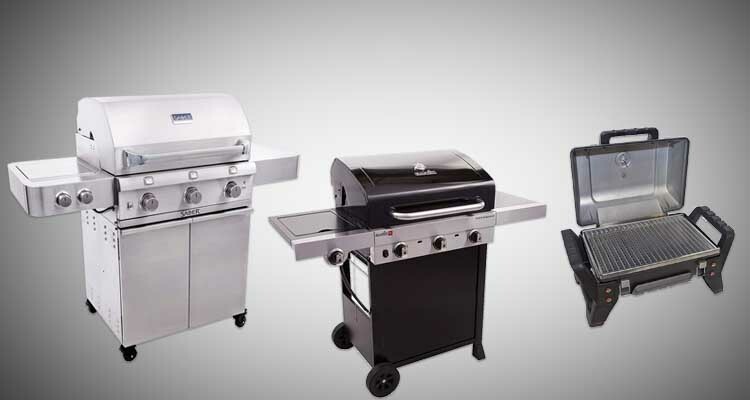 With 500 square inches of cooking space, and the capability to grill, sear, bake, smoke and roast, these units really are a one stop shop when it comes to barbecue. 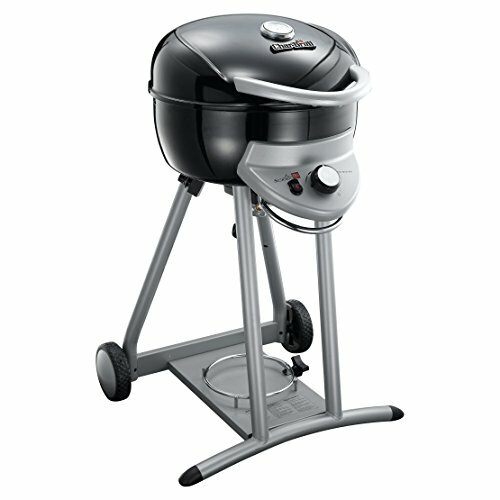 The lid is well insulated so when closed, the grill can be used as a smoker. Throw in a smoker tube filled with your favorite wood chips to make the meat as smoky as you like. When you want to grill, the lid folds away, right out of the road. The sear plates reach a staggering 1800°F – so to say searing is easy is an understatement. Thoughtful design features – such as a cupboard under the grill for storage, tool hooks inside the doors, reversible WAVE designed grill rods to reduce the amount of food that falls through the cracks, and the ability to order the grill natural gas ready. The rotisserie kit that comes with the grill can hold up to 25 pounds. Sheer size. You can cook up to 30 burger patties on the main cooking area of this unit. The knobs on the controls don’t light up at night, so make sure you set it up in a well lit area. The doors on the door are made of plastic, which is a little cheap when compared to the quality of all the other fittings on this grill. There is also the option of a charcoal tray for this grill, but you will have to order it separately. 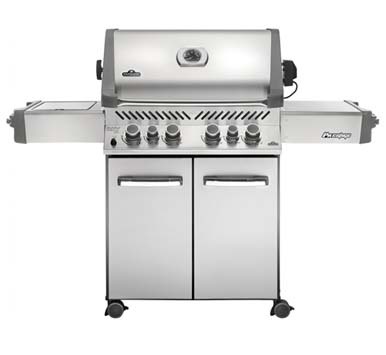 If you are serious about grilling, and are not into DIY’ing a cheaper unit to suit your needs, then the Napoleon Prestige 500 is definitely worth a look. If you want to find in depth information about infrared grills, we have a detailed break down that looks at if they are worth the cost. 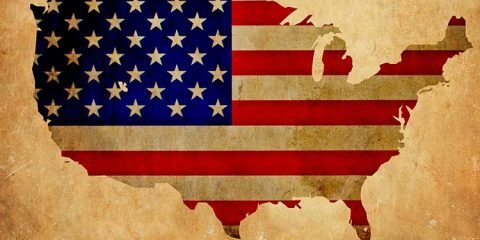 If you want a quick rundown though, read on to learn the essentials. The word “infrared” refers to a method of heat transfer. On infrared grills, grill plates are designed to transfer heat into infrared radiation, and then cook the food. Some infrared grills have one or two grill plates designed to transfer infrared heat, and might be called a ‘sear zone’ or something similar. Other grills are comprised solely of infrared grill plates. You might think this sounds very high tech, or you might even think it could be a health hazard. In reality, the burning coals on a fire also emit infrared radiation. So cooking with infrared radiation has really been around as long as fire has. It just hasn’t been harnessed in a convenient and efficient way until recently. Infrared radiation heats food when electromagnetic waves are emitted from the heated surface. These waves travel at the speed of light and in every direction, so they cook very efficiently and at incredibly high heat when compared to other grilling methods. For example, on an infrared gas grill, the infrared plate is heated by the gas flame underneath the plate. The heat is then emitted off the plate as infrared radiation and cooks the food sitting above. Speed – These grills cook incredibly fast. They can reach 700°F in around 7 minutes. Even Heat – When you grill with infrared, there are no “hot spots” or “cool spots”. Efficiency – Because these grills heat so fast and burn so hot, you can have your cooking done in a very short time. Less Flare Ups – Some types of infrared burners are less likely to cause flare ups due to the sheer intensity of the heat. Easy to Clean – Those super high temps also make cleaning a breeze. Just crank up your infrared burner when you are done and any food left hanging on will be incinerated. Burns Easily – As you can imagine, such intense heat can end up burning your food if you don’t watch it carefully. Some meats like fish may be too delicate for most infrared burners. Less Versatility – Again, the intense heat limits your options. Generally, searing robust meats like beef is where infrared burners come into their own. For this reason, many grills will offer infrared as a “searing zone” with just one or two infrared burners rather than have these burners as your only option on the grill. Adjustment Period – Using infrared is unlike any other type of cooking. For some, the first couple of times they fire one up, it all feels unfamiliar and perhaps a bit hard to control. If you can get past this adjustment period however, infrared cooking does have its place. Infrared grills burn hot, sear better than any other type of grill and brown your meat evenly. 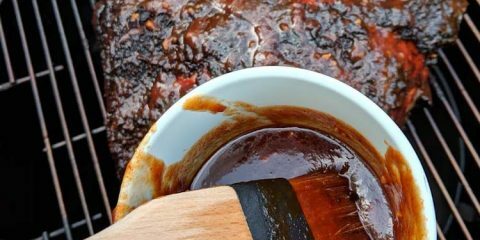 However they can be a bit of a one trick pony when it comes to grilling – and that trick is searing. While you are most likely to see infrared technology in the form of a ‘sear zone’ on a grill, you can get barbecues which use this technology in the cooking chamber as well, and this opens up a whole new area in which infrared technology is an appealing option. If your burner has an infrared plate in the cooking chamber, the heat coming up from the coals is converted into infrared radiation. This means that your food is being cooked by convection (the heat circulating within the oven) conduction (the heat from contact with the cooking grates) AND infrared radiation (coming up off the infrared plate). In short, every last bit of that heat is going to be used up to cook your meat evenly and efficiently. Compare that to a normal cooking chamber. Your food is cooked by convection and conduction only. So yes, your food will still be cooked if you have a “normal” grill, and it will still be mighty tasty. But infrared cooking does have an edge. But – infrared grills cost more. So while there are many advantages to owning an infrared grill, you need to consider your budget too. If your budget is tight, don’t despair. There are a couple of handy accessories on the market that can convert parts of your ordinary grill into infrared. 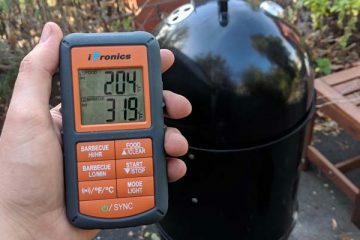 We found these infrared hacks suggested over on amazingribs.com. These interlocking grates amplify heat, prevent flare ups and sear your food really well. No they are not “infrared” technology, but they produce very similar results for a fraction of the cost. 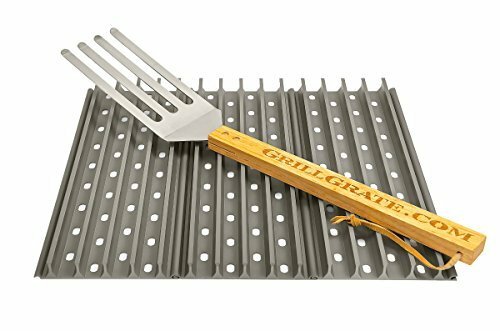 To use these grates, just measure up your grill and buy the right sized grates. Simply take off your existing grates, replace them with the Grill Grates and enjoy great searing. If you have a charcoal grill hanging around, put it to use! For big cook ups when you have multiple things on the go, set up your charcoal grill on the side and sear you meat there. 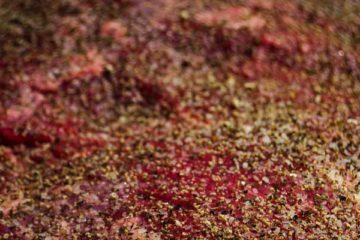 Not only will it leave more space in your grill, but you will get much better results searing over charcoal than you will with other types of grill (aside from infrared, of course). Whack your griddle pan on the grates of your barbecue or side burner, get it piping hot and coat it with just a little oil. The superheated surface will make better contact with your meat and produce superior results for searing than you could expect from an ordinary grill. Deciding whether or not you would like to get an infrared grill is only half the story. Not only are there different types of infrared systems, there are also different infrared grill configurations. First, let’s have a look at the different infrared systems that are on the market. Generally this type of infrared system is for hot and fast cooking. Most ceramic burners are at home around the 600-1000°F mark, which is great for searing, but they don’t offer much versatility. Ceramic systems can be prone to flare ups, as the food sits close to the fame. These systems tend to be cheaper, but they will not produce the same high temperatures as other infrared systems. Heat is produced from stainless steel tube burners, and then transferred to the food by a stainless steel heat emitting panel. You can expect to reach temperatures between 300-650°F when using this type of burner. Stainless Steel IR Burner and Radiant Glass Panel – You can expect temperatures around 350-850°F from this style of burner. It is not prone to flare ups and will produce even heat across the cooking surface. Stainless Steel Conversion Burner and Radiant Glass Panel – This system is basically a slightly improved, more robust version of the system mentioned above. You can expect to reach temperatures of 200-900°F with this system. One of the most popular ways to take advantage of infrared technology is with a hybrid grill. 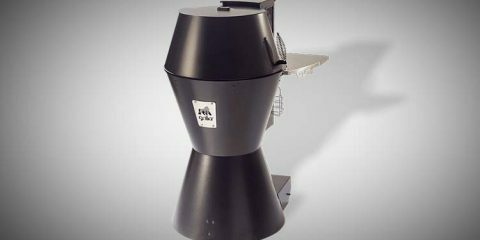 These grills usually have one or two infrared plates only, and the rest of the grill uses a more conventional cooking system. One Preinstalled Burner – One of the burners inside the grill is a permanently fixed infrared burner. You will usually find grills with this feature at a higher price point. Interchangeable Infrared Burner – This is a great option if you are after a slightly cheaper and more flexible option than a preinstalled burner. In this configuration, a regular convection barbecue comes with a seperate infrared burner that can be taken in and out as you need it. Sear Station Side Burner – If you don’t like the idea of taking up precious real estate inside your barbecue with an infrared plate, then you can opt for a “sear station”. This is a fixed infrared burner which is located on the outside of the grill. We have had a look at quite a few grills in this round up. But if you have the budget for it, the Saber 3 Burner Stainless Steel Grill is hard to beat. All of the grills we have looked at in this article are good, and some are specifically designed for special circumstances, for example, portability – for which the Char Broil Grill2Go is in a class of its own. 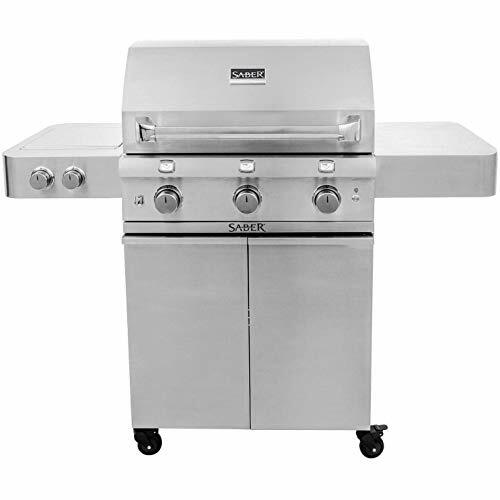 However, if you are after your classic grill that sits on your back porch, has room to cook for a crowd, and comes ready for use without the need for modifications and DIY’s, then the Saber 3 Burner Stainless Steel is the infrared grill for the job. We hope you have found this article helpful. Do you have experience using infrared grills? Which one would you recommend? Let us know in the comments section below. And if you did enjoy this article, please be sure to share.